Russia is entering a new season of music, as the concert scene that lay dormant for the summer gradually reawakens. Veterans of Western rock continue to successfully perform around the country. Fans between the ages of 40 and 60 happily go see the idols of their youth, while the aging musicians earn respectable sums that people in their native countries long ago stopped paying for their shows. On Oct. 8, the renowned British group Uriah Heep will take the stage at Crocus City Hall. They were the first major Western group to come to the Soviet Union after the collapse of the Iron Curtain. At the time, the group did not fill venues at home, which held more than 1,000 people. In Moscow, however, more than 185,000 people turned out to see them over the course of 10 days in 1987. Guitarist Mick Box is the only original band member who remains, but this will not be a deterrent for people who long to hear pieces from the set list of the “Sweet Freedom” anniversary tour. On Oct. 22‒23, the German band The Scorpions will play at the Crocus. These musicians, who, in 1988, found themselves in the right place at the right time on the wave of perestroika, became friendly with Mikhail Gorbachev — the first president of the Soviet Union. Although The Scorpions have since lost their relevance in the world, they can always count on stable earnings in Russia. Two years ago, after embarking on a tour that was supposed to be their last, The Scorpions saw the reaction of the Russian fans and opted to put off their retirement. Along with the Sofia Philharmonic Orchestra, these hard rock stalwarts will play their old songs, as well as covers of songs by Small Faces, The Rolling Stones and even Marc Almond. On Nov. 6, the legendary group Deep Purple will perform at one of the largest concert venues in Moscow — the Olympic stadium. Russia has a particular relationship with Deep Purple. 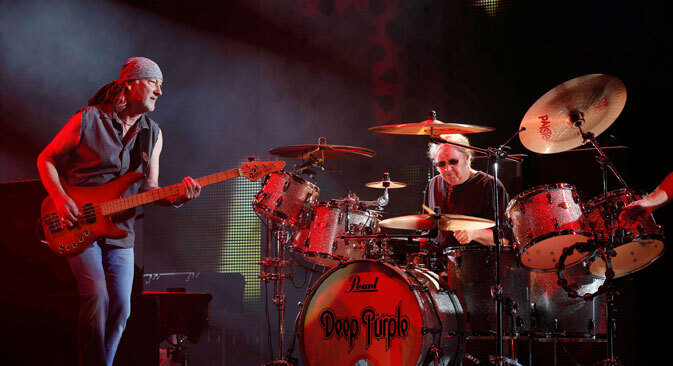 The fact that Deep Purple has become a frequent visitor to Russia is due, in no small part, to the former Russian president and current prime minister, Dmitry Medvedev. The English group The Subways is hitting the Arena Moscow club on Nov. 15. The band is one of the most energetic contemporary indie groups, successfully merging the energy of early “garage” with a punk aesthetic. On Oct. 16, Joe Bonamassa, one of the most interesting musicians today, will show who is who in contemporary blues. His music contains echoes of genre heavyweights Jimi Hendrix and Cream, but the utter unpredictability of his playing style makes him unique. His creative partner, singer Beth Hart, recently performed in Moscow, and Bonamassa's concerts can be called the logical continuation of an acquaintance with the new blues. Without a doubt, the major event of the fall concert season is the visit by the singer-songwriter Suzanne Vega (Oct. 18). “Luka,” which is probably her most famous song, became popular even before MTV debuted in Russia, thanks to a remix by DNA. After the video for this song appeared on Super Channel — the first Western channel to broadcast in Russia — many people became interested in the original version of the song and discovered for themselves the work of this highly distinguished and accomplished singer. Vega has not released a new album in five years, instead working on compilations of her best work and singles. Even still, just as many people want to hear her as before. Other well-known artists are scheduled to perform in Russia this fall, including Black Rebel Motorcycle Club, Orbital, The Brand New Heavies, Freak Power, These New Partisans, Warpaint, Tiger Lillies, Poni Hoax, Travis and many more.